All the new updated songs and news about what's happening in the world of folk and ballads will be posted here. This site will close down soon. The new site will be http://www.irish-folk-songs.com/ all the songs from this site can be found on the new one. The Dubliners are to retire after 50 years of touring and recording. The group will call it a day when their current tour of Ireland is complete. They have just finished their tour of Denmark where the shows were a sell out. It was after the passing of their banjo player Barney McKenna that the rest of The Dubliners decided to call it a day. Gerry O'Connor who had being playing banjo with the Sharon Shannon band replaced Barney McKenna. Gerry is regarded by many as one of the finest 4 string banjo players in the world along with Christy Sheridan. 1984 marked a hugh turning point for The Dubliner's with the passing of Luke Kelly . Luke was always hungry for new songs to play. Since his death the rest of the group pumped out the same songs year after year, the same songs they had being playing since the early 60s when the band were formed. 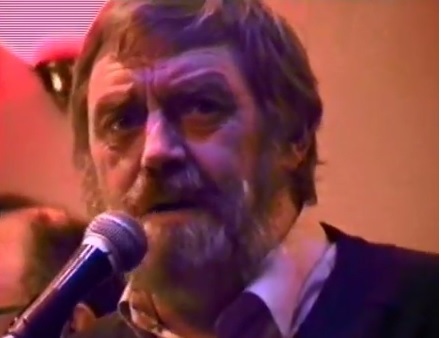 Luke and to a lesser extent Ronnie Drew were always on the look out for newly written songs that would keep the group sound fresh. A hugh wealth of talent passed through the group over the years and it's always being surprising that The Dubliners never wrote songs. They have always being reliant on a others for materal. Songwriters such as Phil Coulter , Pete St. John and Ewan McColl made up half their set list with the remainder being traditional songs. The fact that they didn't write their own songs or didn't add much new materal after the passing of Luke and Ronnie never held them back. The band continued to tour around Europe but on a smaller scale. They recorded several new albums but most of the songs on the albums were already released years earlier. They still attracted hugh crowds where ever they played. When The Dubliners came to town everbody wanted a ticket, even though John Sheehan is the only original member. John joined the group a year or two after the group was formed but he's still regarded as an original member. The original name of the group in 1963 was The Ronnie Drew Group which consisted of Ronnie Drew on guitar and vocals. Ciaran Burke on tin whistle, John Sheehan on Mandolin, Barney McKenna on 4 string banjo and Bobby Lynch on guitar and vocals. Luke Kelly joined two years later and when they were looking to change their name from The Ronnie Drew Group it was Luke who suggested The Dubliners as Luke had being reading a James Joyce book of short stories called ''Dubliners''. With The Dubliners retiring it's a sad time for folk music fans. We have already lost every member of The Clancy Brothers and Tommy Makem. The only remaining group that started out in the 60s that are still with us are The Wolfe Tones who celebrate 50 years together in 2013. All three members of the 'tones are original members that started out as a four piece in 1963. This must be a record regarding all original members of a band still together after 50 years. Have you ever wondered how blind and vision impaired people read guitar chords on a website ? well I never really knew until I got an email from a blind man who comes to the site regulary. Blind people use a text reader for reading the lyrics on the screen. The man in question gave me some praise for the format I use to place the guitar chords between the lyrics and not over the words like most guitar sites do. When a text reader programme scans the text all it can do is read it line by line and if the chords are above the lyrics it will speak out the chords on top before moving to the next line of text which is the lyrics of the song. With the system I use the text reader will read for example the first word then the chord the next few words then the next chords and so on. This is not what I had in mind all them years ago when starting the site, it just so happenes the format I use is of great benifit to the visually impaired and I was delighted to know the site was of great value to all those who have a problem with their sight. A new section for abc notation has been added. Abc is a form of music for anybody that doesn't use sheet music but prefares simple lead notes. It's not just for tin whistle but for most musical instruments including banjo, mandolin piano accordion and so on. The sheet music section on the site gets about one third of all the visits I will ad to this section when I have more time. The tablature notation is now on site for The Green Fields Of France, as you may know this site is primarily for chords as opposed to ''tabs'' , but now and again I may place a bit of tablature to one or two songs. As The Green Fields Of France is one, if not the most popular folk song in the world this is the one I have sought out. The tabs have been worked out by a friend who teaches guitar and also plays in my local pub. It shows all the notes and how to play them. The link to the song is in the Eric Bogle section. A while back I inquired as to why rebel songs were not being played at sessions anymore, I have received a considerable amount of feedback. The ansers came from several scorces including bands, session players, songwriters and punters attending gigs. To summerize the info. I will outline the main reasons in the fall off of rebel songs not being played. No1 reason is there are litteraly only a handfull of ballad groups left doing the pub sessions in Ireland so there's little chance to hear ballads as the norm in your local pub. No 2 reason is cowardice or fear my musicians who don't want to offend someone in the pub that may take offence at rebel songs being played. No 3 is also related to the fear factor by the musicians who are afraid to loose the gig by playing ballads insofar the publican may discontinue the gig. 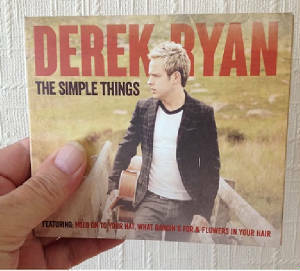 The biggest selling album in Ireland for the week ending Friday the 5th of September 2014 was ''The Simple Things'' by Derek Ryan. I don't know how many records were sold to get the top spot in Ireland but I'm sure my little contribution helped in a small way. yes I actually buy the C.D. rather than download from itunes. You'll always get little bits of info. that you don't get from down loading when you get the C.D. into your hand. Derek has been promoting this new C.D. for the past 2 weeks by visiting record shops around the country and signing copies. Derek does deserve all of his success he receives. 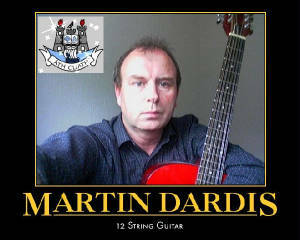 He's one of the hardest working musicians / songwriters in Ireland today. Himself and the band are constantly touring and when Derek's not on the road he's writing and recording new songs. And by the way, when we say the ''Biggest Selling Album'' this includes genre of music, not just country. One of the reasons I set of the section on this site for Derek's songs is because he usually includes a couple of Irish folk songs on his albums. On his latest album Derek covered The Ferryman, he done it in a ''Country Beat'' which sounds a whole lot different to what I'm used to playing and listening to. I will be easing off on the requests I get on Facebook. There are 2 reasons for this. The first is the time it takes to place chords to a song can take a couple of hours and some people who request the chords don't even come back and say thanks. I have crossed oceans to help people out but some people wouldn't cross a puddle in return. The second reason is that I have asked a couple of times on facebook for a bit of help with notes for songs and not got a single responce. Of the 4,000 followers of this site on facebook there are a couple of hundred musicians and many are professional musicians who wouldn't give a dig out. I was never a big fan of facebook and never relied on it for getting help anyway. I have a handful of friends who I turn to when I'm stuck for notes and chords and they have served the site well over the years long before facebook was born. Paddy McGuigan from the Irish ballad group The Barleycorn died on the 17th of March 2014. Some will not of known Paddy but would have known his songs. Paddy wrote some of the finest ballads about Ireland and it's people in the past 40 years. Examples of his songs are, The Boys Of The Old Brigade, The Irish Soldier Laddie, Bring Them Home, The Men Behind The Wire and many more. The Wolfe Tones played and recorded many of Paddy's songs over the years along with Charlie And The Bhoys and many other ballad groups got their songs from the writing of Paddy McGuigan. If there's one thing that always stuck on my mind about Paddy's songs is the fact that when you listen or play his songs you get the feeling each of his songs are older that they actually are. Many's a year ago I had the pleasure of playing and singing at a session with him. Rest In Peace Paddy, you were one of the finest singer / songwriters this country has ever had. I now have the tin whistle notes for Wake Me Up by Avicii / Derek Ryan. 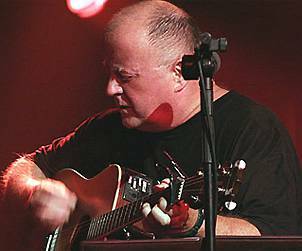 Here's what Christy Moore says about making a song too complicated. Yes I agree with him. knowledge. I have no theory and cannot read music. ones. Such musicians create the magic moments. At times content gets added to this site that does not get linked to in this updates section. An example would be when I have posted a new tin whistle video that includes the notes on a page that is not included in the whistle section. These notes will be placed along side the lyrics of a given song. This is because I don't have the sheet music for ''All The Songs In The Lyrics And Chords Section'' . So to be kept up to date with all the updates subscribe to the facebook page by the ''Like Button'' . 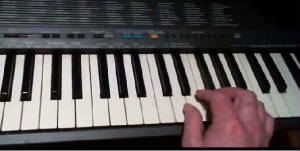 I have now added more of these video lessons for playing the keyboard. The latest are The Foggy Dew, Only Our River Run Free and that beautiful old song The Snowy Breasted Pearl which is a favorite of mine,Long Before Your Time, Whiskey In The Jar and The Town I Loved So Well. and again I have written down the notes in an easy to read format. A bit of a storm blew up recently over a song that slags off the former British Prime Minister Margaret Thatcher. The song reached the top end of the British music charts. It's an old song ''Ding Dong The Witch is Dead'' from the film The Wizard Of Os 1939. Some radio stations in Britain are refusing to play the song, including The B.B.C. R.T.E. which is a state owned radio and television broadcaster joined the debate and featured the story on their main evening news ''6 one''. They asked for comments from D.Js if they would have any problems playing the song on their programme. All the D.Js said they would play the song and said the B.B.C. should also play in. One of R.T.Es longest searving broadcasters ''Larry Gogan'' said if a song is in the charts regardless of it's topic it should be played. Now this got me thinking [ a dangerous thing] about all the songs that were in the Irish charts over the last 30 years that R.T.E. refused point blank to play on the air waves. Anyone who has visited this site regularly over the years would know I have been campaigning to get Irish folk songs played on Irish radio and television. Anyway, when The Wolfe Tones song Admiral William Browne reached the top of the charts in 82' it was black listed by R.T.E. The same D.J. who now says that when any song reaches the top of the charts it should be played refused to play Admiral William Brown . It's very rare to hear The Wolfe Tones played on R.T.E. , even the non-rebel songs dont get an airing. It's not only The Wolfe Tones who don't have their music played on the radio, folk and ballad music in general is shunned. Recently some well known singers and songwriters including Phil Coulter met with the n Minister for Communications Pat Rabbit in the hope of forcing the radio and t.v. station to have a percentage of their output dedicated to Irish music. I don't hold out much hope on this one as the majority of the independent media in Ireland is owned by big business who also control the music business. R.T.E. is funded by the tax payer who pays €160 a year for a licence. A large proportion of the population's music taste is not catered for by R.T.E. On the one hand you have D.J.s who bend over backwords to to get their message out that they would have no problem playing a song that slags of the former British Prime Minister Margaret Thatcher and on the other hand refuse the play their fellow countrymen's music. 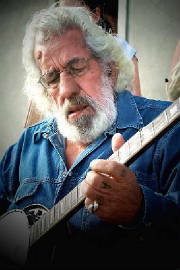 20/12/2012 The Pecker Dunne has died, he was 80 years old and died at his home in Killimer Co. Clare. He was from Crumlin in Dublin and his parents were from Co. Wexford. The Pecker wrote many's a fine song over the years and several are included on this site. His most famous would be O'Sullivan's John which he recorded himself but Johnny McEvoy made a huge hit from it. Other songs by ''The Pecker'' were Wexford Town and Tinker's Lullaby. Pecker made his living on the road like man's a tinker in Ireland, you'd often hear him playing his ballads on his 5 string banjo outside G.A.A. football grounds on Sunday's. He will be truly missed by all folk singers in Ireland. the 19th century as the Irish language was declining. was transcribed from the Irish. between a boy and girl who are courting. One such example is ÉALAIGH LIOM But macaronic music isn't confined only to folk songs, the best know pop one is by Elvis Presley singing Wooden Heart in English and German. Playing banjo chords- The Irish tenor banjo is mostly played as a lead instrument but ou can also play chords on the Irish 4 string banjo, there's a handy diagram which shows you how to play four of the most popular chords on the banjo in the mandolin section. As the banjo is tuned the very same way as the mandolin then the chords are the same. Here's the link to show you how to play chords on the Irish banjo. Well, it's almost ten years now since I started colecting song lyrics and chords and placing them on the internet. I started off with a very small site hosted by Expage who are no longer around. I had no experence at all when I started and it used to take be over an hour just to type out the lyrics of only one song. I moved to this website around 2004 when Expage closed down and it's been going well ever since. I'd type out the songs from memory or from playing a C.D. over and over and go back and fill in the chords. It's been a hard auld slog but I got there in the end. I think it was around 2004 that I lost half of my hearing, I went totally deaf in one ear. This was a big set back as I was never the same with working out chords after that but I knew the basics of how music went in relation to chords and keys and soon got back into the swing of thing. The site has grown leaps and bounds over the years with the addition of new songs. In 2004 the site was getting about 1,500 visitors a day which wasn't bad. Today on average it gets around 14,000 hits a day. in total since I started there have been 13,518,926. I received much help over the years from folk music fans to which I'm very greatful. Marc in particular has been a hugh help with working out the guitar part of some of the most complicated chord arrangement on certain songs. The + 1 button on this site is a way to recommend Irish Songs And Guitar Chords to your friends. The + 1 button is by Google and if you have a google account and are signed in you'll see the + 1 logo when you do a google search and you can also see the logo displayed on this site's homepage at the bottom. When you click the + one button you're recommending this site to any of your friends that are also signed into their google account. You will be also helping this site gain new visitors by just clicking the + 1 button. I just thought I'd explain that in case you didn't already know.